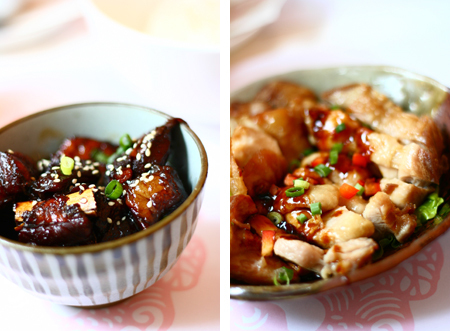 northern chinese | tasty treats! I used to have a flatmate who came from Beijing, and this is a dish that she made for me once that I immediately fell in love with. 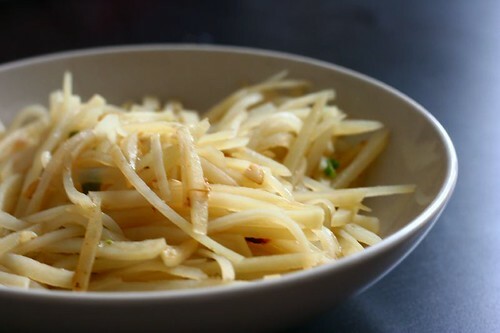 It’s a popular northern Chinese dish of shredded potatoes with chilli and vinegar, and from what I can glean from the internet, it’s original name is qing jiao tu dou si (青椒土豆丝), or ‘green chilli potato shreds’. It was nothing like I’d ever eaten before – a testament to the vast differences between northern and southern Chinese cuisine (the latter of which I am more familiar with, having lived/living in Hong Kong). The potatoes are shredded finely (a skill in itself) and quickly stir-fried with hot chillies, splashes of vinegar (usually Chinese black rice vinegar), and seasoned with soy sauce. It’s cooked very quickly so that the potatoes still retain a crunch; this was definitely a strange experience at first, having only eaten potatoes in their starchy softness, in the form of mashed potatoes and chips. But it definitely works – it’s refreshing and the texture resembles the radish, somewhat. It’s difficult to liken it to anything, really. I’ve converted quite a few people onto this dish, and it’s easy to see why. It’s simple, yet novel (for us ignorant people not familiar with northern Chinese cuisine anyway!). It’s light and tasty – spicy, sour, and savoury all at once. And it’s incredibly easy to make – the most grueling part is just slicing the potato meticulously into thin shreds, something you will undoubtedly get used to. I usually only quickly stir-fry the potato for about 5-6 minutes, just until the starch of the potato comes out and the liquid in the wok (from the soy sauce, vinegar, and any water in the potato) starts to thicken. 1. Prepare the potato by cutting it in half lengthways. Place each half flat side down, and slice each thinly (3-4mm, if you can manage, the thinner the better!). For every 4-5 slices, lay flat and slice again lengthways, to create long matchstick-like pieces. Leave to soak in a large bowl of cold water to prevent the potatoes from going black. 3. Meanwhile, drain the potatoes in a colander. Add to the wok and quickly stir fry for another minute. Add the rice vinegar, soy sauce and sugar. Keep tossing the potatoes for another 4-5 minutes until you start to see the liquid in the pan thicken. 4. Add the chopped spring onions, toss once more to mix in, and serve.